Each and every one of us has a truly fundamental relationship with soil, even those of us who can’t remember the last time our hands were dirty. Soil affects us every day, at least three times a day; every piece of food we have eaten ultimately came from the soil. Plants literally transform dirt and sunshine into tasty energy for us to eat. We eat some plants, while others feed animals which feed us. Regardless of the form it takes, the nutrients in every bite of food you take were once soil. To take this one step further: all of the atoms and molecules in our bodies were at one time… just soil! And at some point in the future, they’ll be soil again. The fact that our bodies right now are not soil is only temporary. There’s a thought to ponder. Our lives are interwoven with the soil systems around us. If we want the soil to continue sustaining us (and all living things), we must ensure that a balance is maintained and that these delicate systems will be intact 20 years, 100 years, and even 500 years from now. 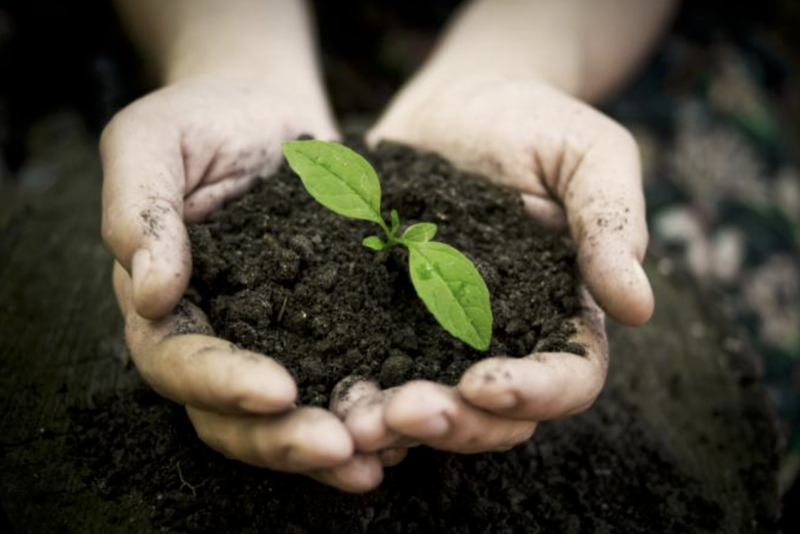 When is the last time you dug your hands into some dark, loamy soil? We have seen – both in textbooks and in real life – thousand-acre farms with mono-cropped fields, fed with synthetic fertilizers and managed with pesticides and herbicides. There is barely a cricket to chirp or a bird to sing. 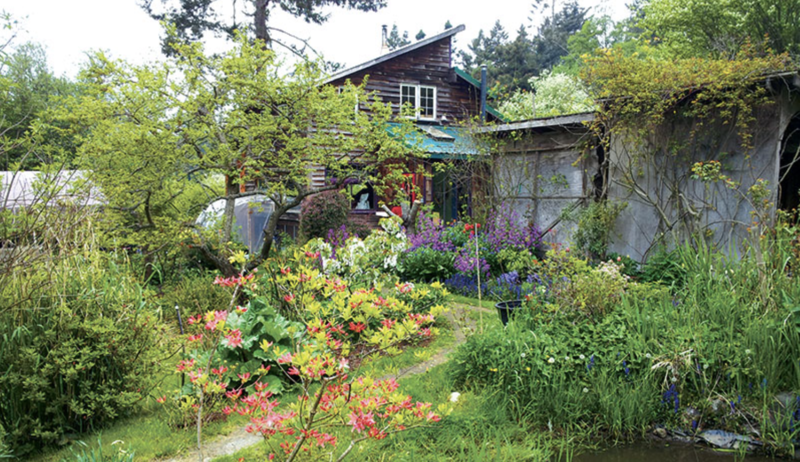 We have also seen five-acre plots, free of synthetic chemicals, growing more varieties of vegetables than you can name; complete with wild weeds, buzzing insects, and chattering birds. 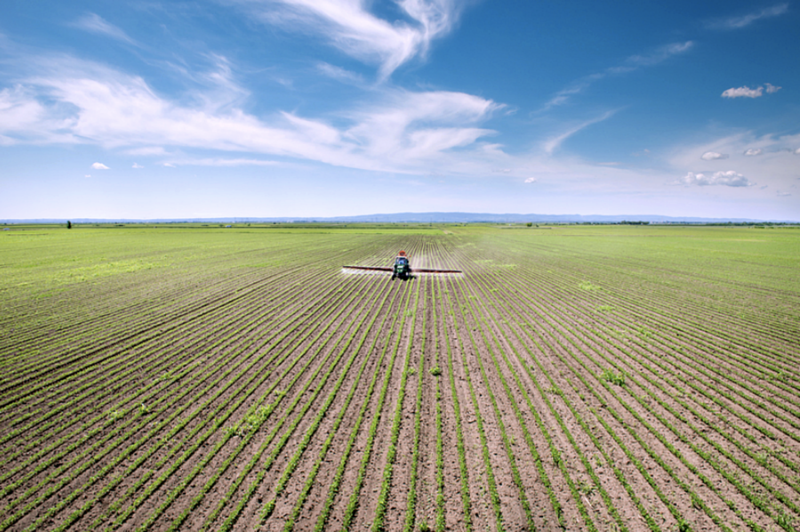 A tractor sprays pesticides on a soybean crop. Monoculture farming methods have long-lasting implications for the health of our planet & ecosystem. One way we build our soils is by adding large amounts of local animal manure to our fields. Many fertilizers, despite being organic, can come from far away and have environmental impacts associated with transportation. By using local manure, we minimize our transportation footprint, reduce our need for fertilizer, and add natural, nutrient-rich, organic matter right to our soil. Another soil-building practice we use is the planting of cover crops. 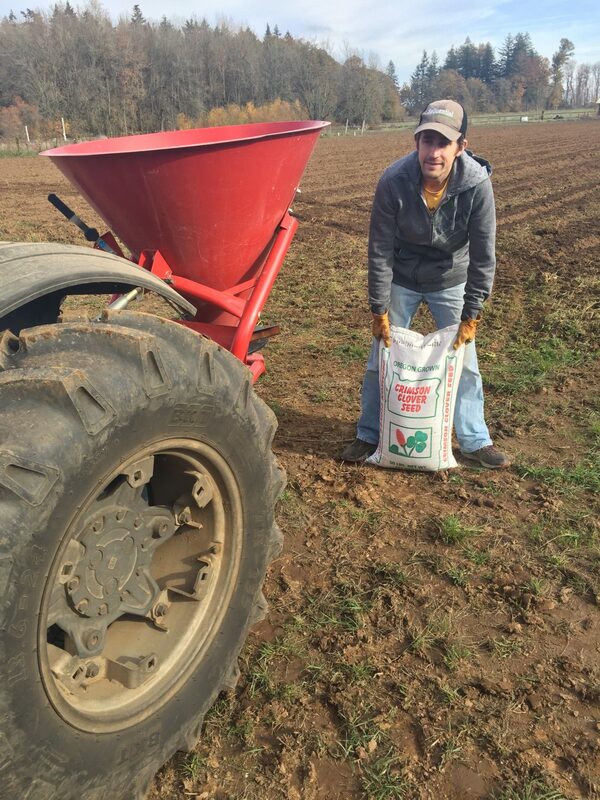 In the off-season, we plant cover crops in order to protect the soil, increase organic matter, and add nutrients. During the growing season, we plant cover crops to improve biodiversity in our fields. Both seasons of cover crop help to discourage weeds and provide year-round insect habitat. This allows us to protect and encourage populations of beneficial insects and pollinators that play crucial roles for both the ecosystem and humans. Pollinator friendly farms help protect bees and other vulnerable insects, while also protecting the food sources that rely on their pollination. Photo: Reid Adams. We avoid using herbicides and pesticides on our farm by finding alternative ways to achieve similar goals. Why kill unwanted plants with herbicides, when carefully timed tilling and planting can make such chemicals unnecessary? And why rely on pesticides (with collateral damage to other insect species), when bringing in beneficial predatory insects can help target specific pest populations to keep them in check? These beneficial insects selectively feed on bad bugs while leaving other species, such as pollinators, unharmed. Neoseiulus californicus is a predatory insect that feeds on mites and other pests. Predatory insects are a natural alternative to pesticide sprays. A farm is not just about pumping up nutrient fertility and getting higher yields. It’s also an opportunity to directly benefit the local environment in many ways. One way we accomplish this is by encouraging biodiversity. There is a permaculture principle that “Diversity Breeds Resilience.” This means that the stronger the web of connections within a system, the more stability that system has, and the more resilient it will be amidst pressure or change. For example, planting several varieties of leafy greens is more stable than planting just one variety. If a certain variety doesn’t thrive or falls prey to pests, the losses are contained and the whole system is more resilient. We seek to be proactive in our relationship with the creatures living on our farm. Cultivating mason bees helps keep flower populations healthy, as well as providing pollination to all those tasty summer fruits and veggies. A wide variety of flowering plants provides food for pollinators throughout the season when other sources of pollen and nectar may be unavailable. 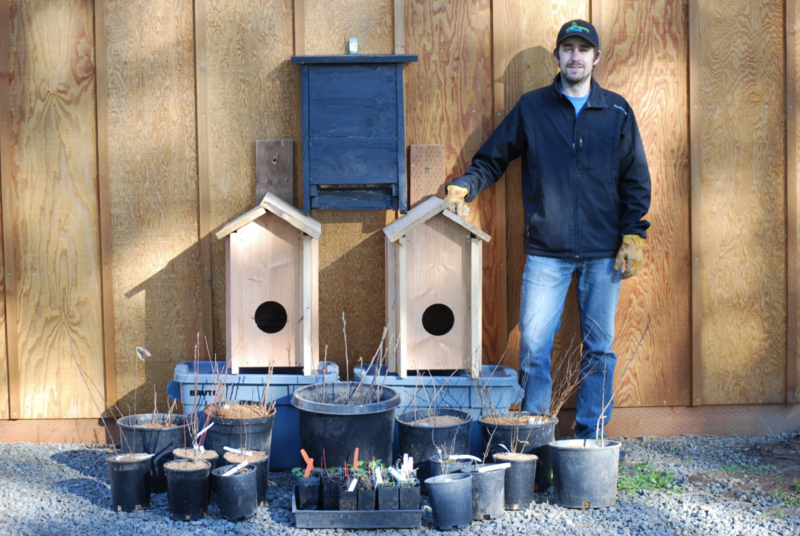 Owl and bat boxes give a home to important predators, which keep rodent and insect populations in check. Planting native plants in hedgerows and pond edges stabilizes the soil and provides habitat for all manner of wildlife, plus a year-round supply of pollen for many insects and bees. 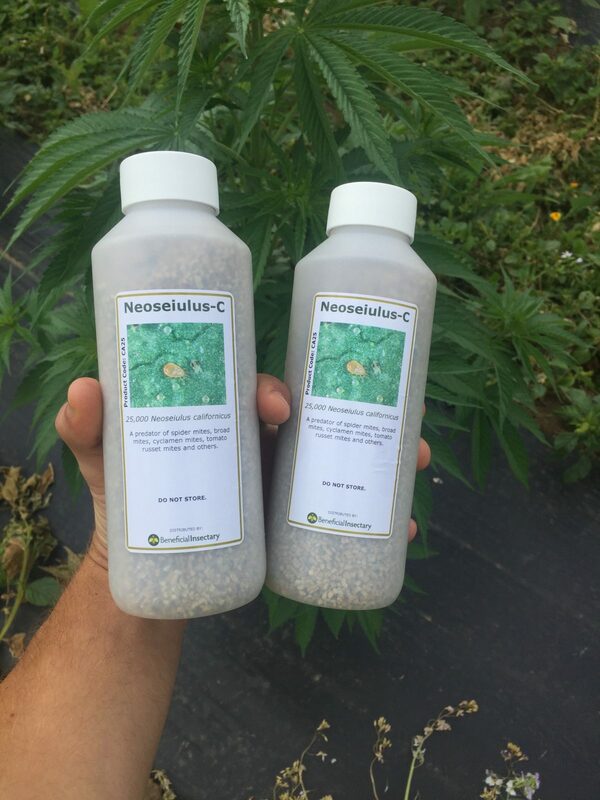 At Frogsong Farm, we never use pesticides or herbicides on our hemp plants or on our fields. Instead of spraying for pests, we plant a variety of plants and flowers which attract a diverse, thriving ecosystem of insects, both “good” and “bad”. This diversity helps establish a dynamic population balance that prevents unwanted insects from growing to a point where they become a problem. In a system like this, there is little need for synthetic chemicals to kill unwanted insects or plants; a healthy ecosystem largely regulates itself. We simply nudge it in the right direction. David Adams, Director of Compliance & Logistics, preparing to plant a native hedgerow which provides habitat for birds and bugs, a year-round food-source for pollinators, and a windbreak for our fields. Such a proliferation of life is not only pleasing to experience, but in fact increases the health and fertility of the land. As plants and animals live, grow, and die in and on the soil, organic matter accumulates. The availability of key nutrients increases and carbon is captured out of the atmosphere and transferred into the ground. Plants, both living and dead, provide protection and habitat for various insects, who are in turn food for a vast array of birds. This food chain is more of an intricate web, all elements depending on other elements to thrive. The more diverse life is, the better life grows. Our aim at Frogsong is to eventually transition to no-till agriculture. The underlying idea here is to let nature do what it does best, which is creating a healthy, diverse, thriving ecosystem. Modern conventional (tillage) agriculture can be envisioned the following way: imagine you gave a plot of land and natural resources to a group of people and said, “Start building yourself a society.” Then, every year, you came back and destroyed everything they had built so they had to keep starting over. It would be impossible for that society to progress beyond anything extremely basic! In conventional agriculture we are doing just that – each year we mow everything down, plow and till the soil, and kill the community of organisms that had begun to establish in that ecosystem. We are effectively asking the soil food web to start over again from nothing. 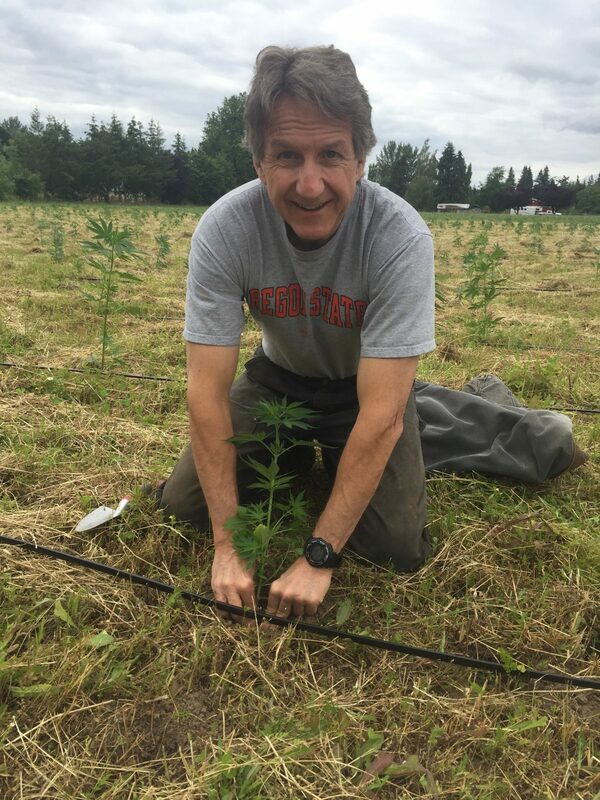 CEO & Co-Founder Chuck Adams transplants a hemp plant into the 2018 no-till test plot. The idea behind no-till agriculture is that as each year passes in a properly managed plot, the ecosystem and soil become more diverse and the number of organisms living there increases. As this happens, the ecosystem becomes healthier, stronger, and better equipped to deal with environmental stresses such as our ever changing and erratic weather patterns, drought, disease, and pests. David prepares to plant our crimson clover cover crop. A no-till approach would have many trickle down benefits and trade-offs. We would be able to conserve labor, fuel, and equipment wear-and-tear by working the fields less. Instead of buying and spreading fertilizers, we could use organic composts, many made on site. We could plant deep-rooted perennial cover crops that fix nitrogen, pull up different nutrients from deep down in the soil, and make those nutrients available at the soil surface. We could “chop and drop” these cover crops so they act as mulch and also feed the soil as they break down in place. Instead of needing plastic mulch to help retain water and block out weeds, we could have a natural mulch layer that keeps unwanted weeds from growing, all the while improving soil health, increasing ecosystem diversity, and adding organic matter to the soil. Instead of disking and tilling the soil to loosen and aerate it, we could use plants with aggressive root systems to perform the same task. As these plants die their roots would decompose and add more organic matter to the soil. As the soil is left alone, populations of earthworms, moles and other soil-dwelling animals would increase, further aerating and fertilizing the soil. Composting keeps nutrients and organic matter on site. 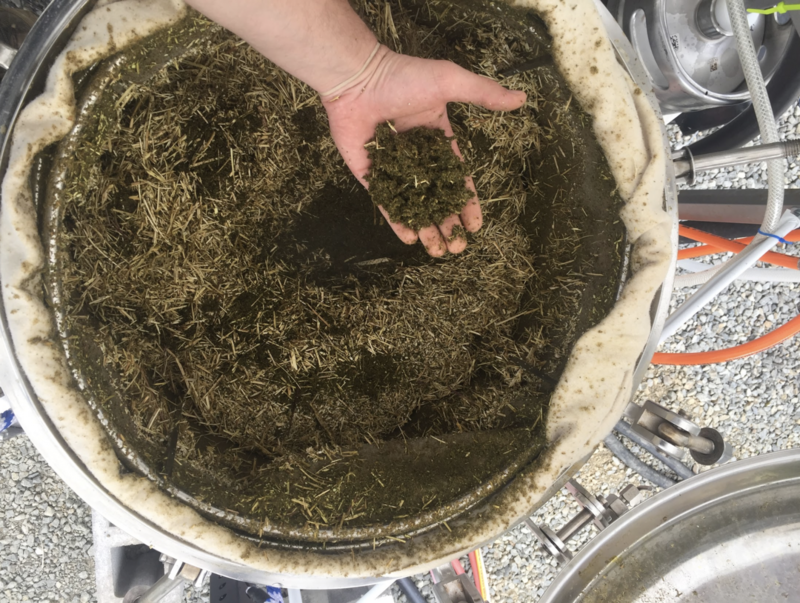 Here, after extraction, used flowers are ready to be composted and returned to the hemp field. Why is organic matter so important? It is the lifeblood of the soil. It makes nutrients bioavailable and keeps organisms thriving. It also acts as a sponge, slowing the movement of water and preventing soil erosion and compaction. Plant health and yields are directly affected by the amount of organic matter found in the soil. 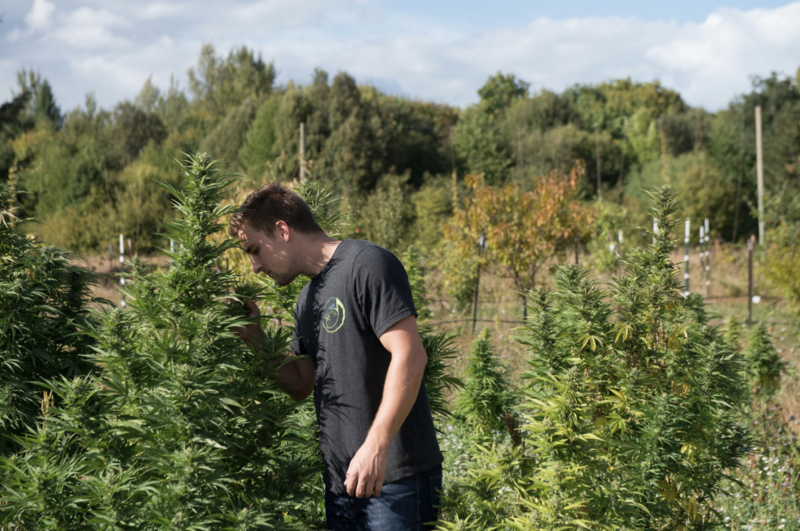 Healthy soils lead to healthy hemp plants, rich in CBD, trace cannabinoids, & terpenes. Being a steward for the land is an extremely slow and laborious process. Significant changes in soil properties in response to different management practices can take place over decades and even longer. 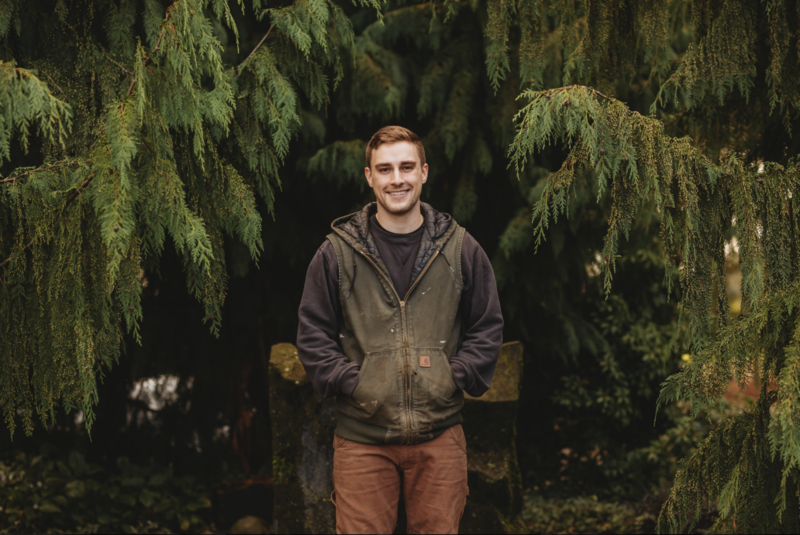 Over time the soils at Frogsong Farm will accumulate organic matter, improving the availability of nutrients and the structure of the soil. As this happens, fewer and fewer off-farm inputs like fertilizers will be needed to maximize crop yields. As hedgerows filled with native plants become more established, a robust habitat will become available for all manner of animals and insects. Breathing it in. 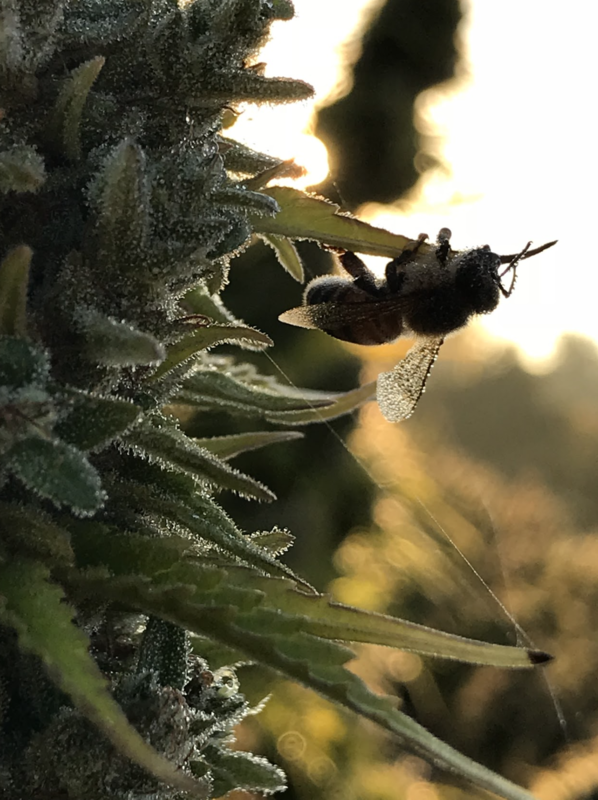 Brett stops to smell the hemp buds while monitoring flower development. 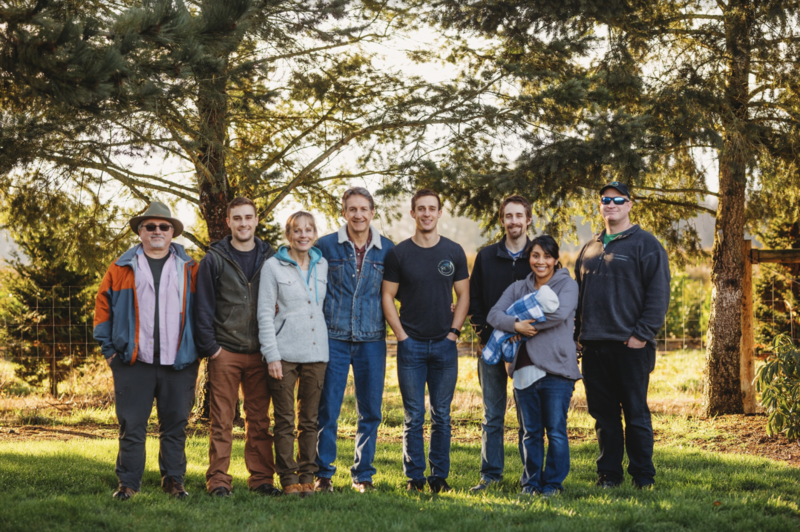 Moving forward into the future, Frogsong Farm intends to increase the diversity and sheer amount of life both on and around the farm, while decreasing reliance on off-farm inputs and focusing on local, organic nutrient sources. Not only do we aim to have healthy and high yielding crops this year, but our goal is to add more and more fertility to the soil each and every year of our existence. Happy B Corp Month! Thank you for supporting Frogsong Farm and other companies working to benefit the earth and its inhabitants. You can support sustainable CBD and ethical land management by ordering your CBD from Frogsong Farm. The family of dreamers behind Frogsong Farm. 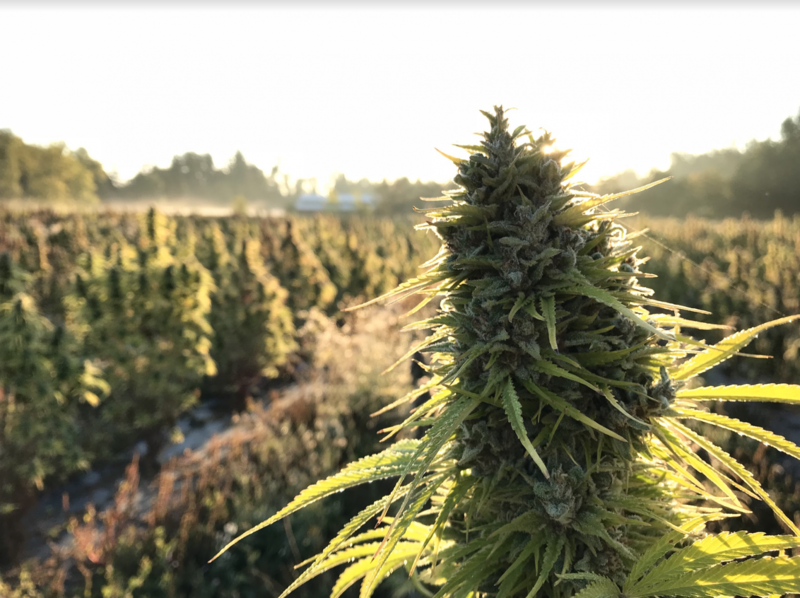 This entry was posted in Education, Essays & Creative Writing, Farm Updates, Uncategorized and tagged b corporation, best cbd, best cbd brand, biodiversity, cbd benefits, CBD oil, certified b corp, family farming, fertilizing, frogsong farm, hemp cbd, hemp derived cbd, hemp farming, organic matter, permaculture, soil builders, soil health, soil matters, soil science, sustainable agriculture. There’s so much learning in this article. Thank you for providing it all. And in such a poignant and passionate undertaking. I look forward to learning more and supporting Frogsong Farm.